It’s time to bring a touch of French luxury to the festive season as Grey Goose has launched an inspirational gift idea for those wanting to gift extraordinary. 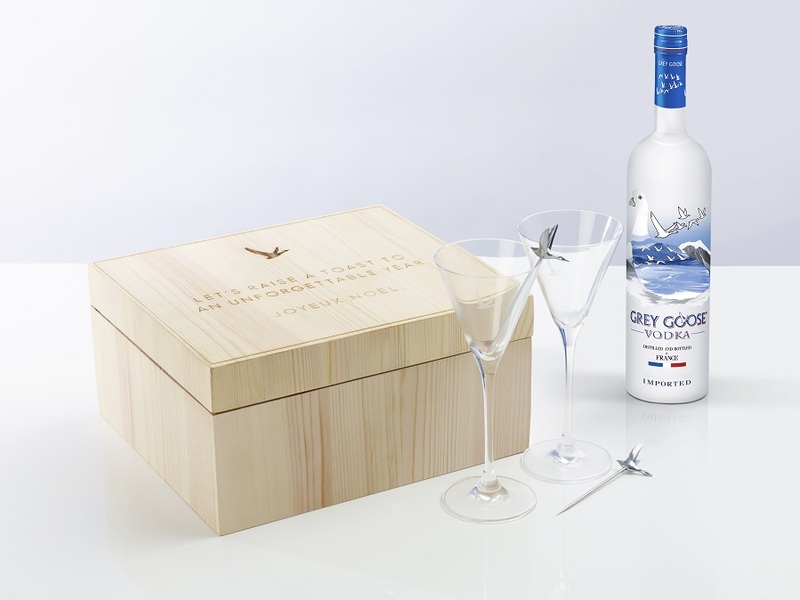 Grey Goose has teamed up with Selfridges this Christmas to offer a limited edition martini cocktail gift box, which can be personalised with a message for friends and loved ones, creating an effortlessly bespoke keepsake. Each exquisite gift set is presented in a carefully crafted wooden gift box with the engraved message displayed on the lid, imbuing French elegance just like the smooth-tasting signature vodka. Inside, the martini cocktail gift box features a pair of classic martini cocktail glasses, Grey Goose olive picks and a cocktail recipe booklet, to inspire even the most ardent of cocktail lovers. Each gift box comes with an iconic bottle of Grey Goose Vodka. For added sparkle, a 1.5L limited edition Grey Goose La Nuit des Étoiles bottle is also available to purchase exclusively at Selfridges. A striking new interpretation of the classic Grey Goose bottle, inspired by the star-lit evenings of the Côte d’Azur, this is a must- have gift for vodka lovers with discerning taste this Christmas. The martini cocktail gift boxes are available for personalised engravings in Selfridges London Oxford Street at RRP £64.99, from Friday 4th November until Monday 2nd January. Selfridges Manchester Trafford Centre and Selfridges Birmingham Bullring are also offering the limited edition gift boxes in-store, where visitors can personalise their messages onto a beautiful silver gift tag every weekend from Saturday 26th November until Saturday 31st December.